I can’t remember everything. In fact, anything past the last week gets pretty fuzzy. That’s why I try to share as much as I can through this personal blog. 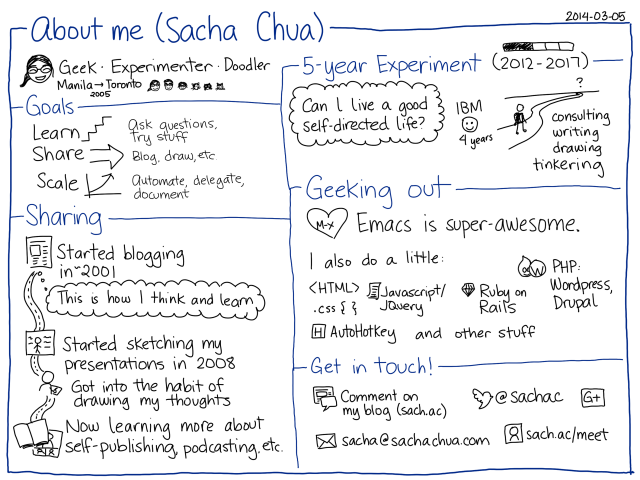 You’ll find notes about sketchnoting, Emacs, visual book reviews, self-tracking, blogging, life, automation, delegation… whatever I’m learning about or whatever I can help other people learn. I post roughly weekly (well, twice: Emacs News, and my weekly review), and someday I’ll get back to being able to write more often. Since I write about a wide range of topics, you may want to browse or subscribe to specific categories – or maybe you want to see everything, because the intersections of interests can be fun. If you like what you’re reading, you can subscribe so that updates are automatically delivered to you daily, weekly, or monthly. =) Enjoy! 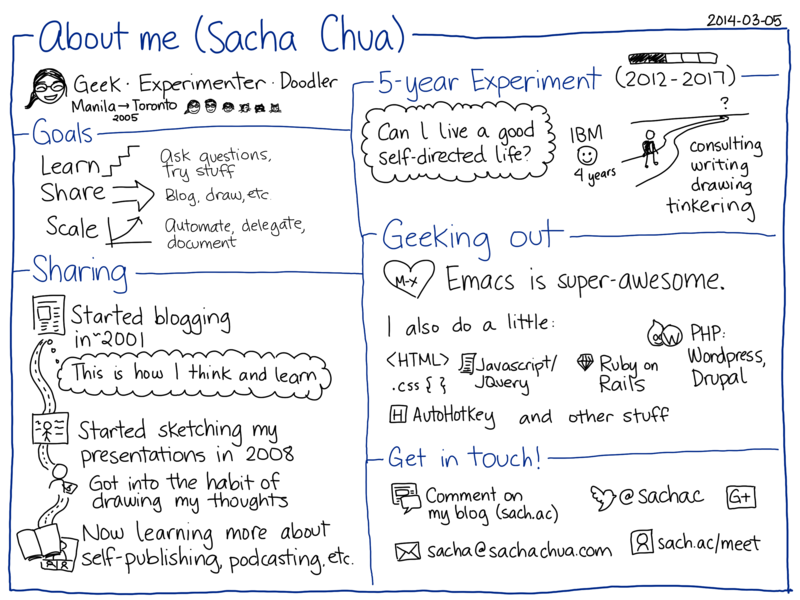 “Sacha Chua” can be a little hard to spell, so you can also get to this blog at LivingAnAwesomeLife.com. I use a WordPress self-hosted blog on a Linode virtual private server. Fonts: Open Sans. Commenting system: Disqus. I use Emacs and Org Mode for my weekly reviews (and pretty much everything else). I use Krita on a Lenovo X220i tablet PC for many of my drawings, and I sometimes scan in paper with a Fujitsu ScanSnap IX500 or a multifunction printer.